The Vermont Sesquicentennial Half Dollar Classic Commemorative Coin commemorates the 150th anniversary of the Battle of Bennington and the independence of Vermont. On February 24, 1925, the 68th Congress approved an act which became Public Law 68-452 to recognize three historical anniversaries with three different coins. One of those coins was the Vermont Sesquicentennial half dollar. The law began, "That in commemoration of the one hundred and fiftieth anniversary of the Battle of Bennington and the independence of Vermont there shall be coined in the mints of the United States silver 50-cent pieces to the number of forty thousand, such 50-cent pieces to be of the standard troy weight, composition, diameter, device, and design as shall be fixed by the Director of the Mint, with the approval of the Secretary of the Treasury, which said 50-cent pieces shall be legal tender in any payment to the amount of their face value." The law concluded with the Proviso: "That the United States shall not be subject to the expense of making the necessary dies and other preparations for this coinage." The coin's estimated value ranges from $190 (low grade - XF) to $750 (high grade - MS-66). Extraordinary characteristics on the Vermont Sesquicentennial Half Dollar can command a price outside the estimated value range. 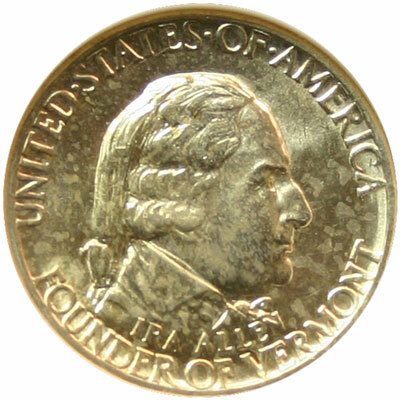 The obverse or front of the coin shows a profile portrait of Ira Allen recognized as the founder of Vermont. The coinage inscriptions say, United States of America, Ira Allen, and Founder of Vermont. The reverse or back of the coin includes the figure of a catamount, large wild cat native to Vermont in the frontier years. 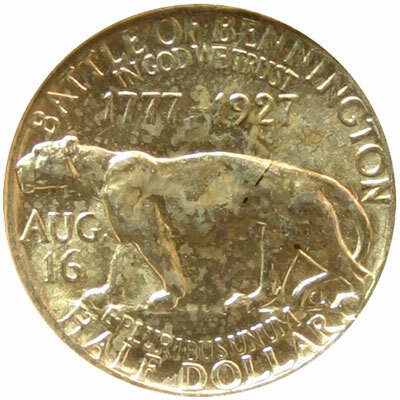 The coinage inscriptions read Battle of Bennington, In God We Trust, 1777–1927, Aug. 16, E Pluribus Unum, and Half Dollar. Though the stated mintage limit was 40,000, records show just over 28,000 of the coins were distributed. Vermont recognizes August 16 as a legal holiday known as Battle of Bennington Day. Begun in the early 1760s, Ira Allen and his brother, Ethan, led the Green Mountain Boys militia to protect the homes and towns of what is now Vermont from being overtaken by New York. The Green Mountain Boys also were instrumental in rejecting the British objective to cut off the New England region from the southern colonies during the American Revolution. The Battle of Bennington (opens in a new tab) between the patriots and the British actually occurred in New York roughly 10 miles from Bennington, Vermont. The catamount is better known as the cougar, which is also known as a puma, mountain lion or panther. The cougar, considered part of the small cat family, can be as large as an adult human. The last Vermont catamount was killed in November 1881. Today, the cougar's habitat is mostly in the northwestern states, though unverified sightings were reported in the northeast, as far north as Maine in the late 1990s. In 2011, the cougar struck and killed by a car in Connecticut was believed to be from South Dakota. Motion sensitive wildlife cameras also find the cats roaming in Illinois and Indiana. Visit our GACS Numismatic Shoppe Vermont Sesquicentennial for a variety of useful items decorated with images of the classic commemorative silver half dollar coin.